Authorities say they have no idea where the massive, messy sandwich appeared from, or why. 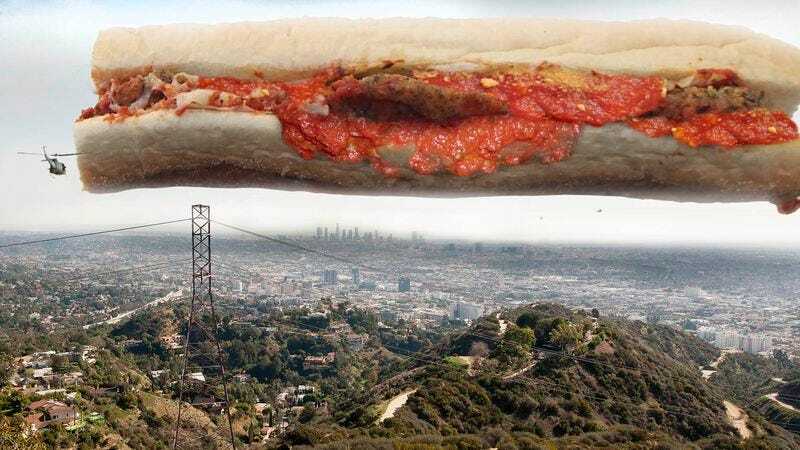 WASHINGTON—Eliciting reactions of wonder and awe in millions of Americans since appearing on the nation’s skyline this week, a giant, sloppy chicken parmesan sandwich continues to hover enticingly above the continental United States with no sign as to its origin or greater purpose, sources across the country are reporting. The gooey and glistening sandwich, which is currently visible on the horizon from every vantage point within the United States, has been hanging inertly above the country for approximately 32 hours, bringing the nation to a near total standstill as government officials and American citizens alike gaze on in rapt fascination. Authorities have also reported at press time that the sandwich appears to feature a mixture of parmesan and mozzarella cheeses in equal proportions. Experts have estimated that in the first day of the gigantic, messy parm’s arrival, the U.S. economy suffered more than $600 million in lost productivity, in addition to millions of dollars in damages from accidents caused by Americans trying to run or drive toward the sandwich while paying no heed to the obstacles directly in their path. Until such time as the gigantic chicken parm can be contained or consumed, authorities have urged the American populace to cease all regular activity, head outside, and gaze longingly at the majestic expanse of the sandwich. “Sometimes I’ll get a little side order of marinara sauce so I can dip the sandwich in the sauce,” the president added, staring into the sandwich as he walked slowly toward it.